Bush & Co. believe that they have escaped war crimes trials - they are wrong and will eventually be prosecuted for war crimes and mass-murder of our military personnel and civilians caught up in their illegal, immoral, bogus wars on "terror"
I write this letter, my last letter, to you, Mr. Bush and Mr. Cheney. I write not because I think you grasp the terrible human and moral consequences of your lies, manipulation and thirst for wealth and power. I write this letter because, before my own death, I want to make it clear that I, and hundreds of thousands of my fellow veterans, along with millions of my fellow citizens, along with hundreds of millions more in Iraq and the Middle East, know fully who you are and what you have done. I joined the Army two days after the 9/11 attacks. I joined the Army because our country had been attacked. I wanted to strike back at those who had killed some 3,000 of my fellow citizens. I did not join the Army to go to Iraq, a country that had no part in the September 2001 attacks and did not pose a threat to its neighbors, much less to the United States. I did not join the Army to “liberate” Iraqis or to shut down mythical weapons-of-mass-destruction facilities or to implant what you cynically called “democracy” in Baghdad and the Middle East. I did not join the Army to rebuild Iraq, which at the time you told us could be paid for by Iraq’s oil revenues. 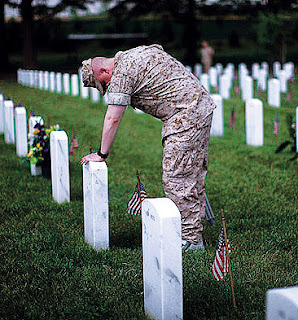 Instead, this war has cost the United States over $3 trillion. I especially did not join the Army to carry out pre-emptive war. 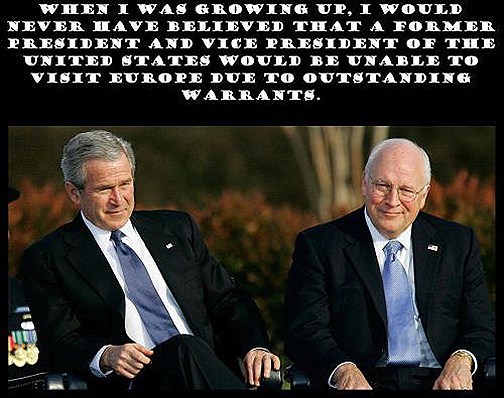 Pre-emptive war is illegal under international law. 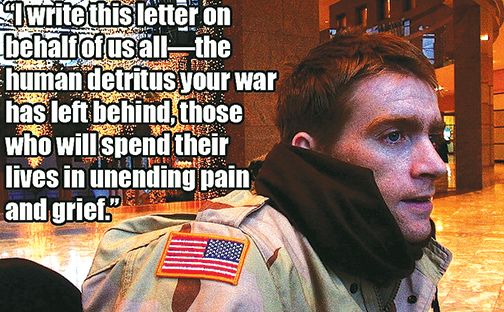 And as a soldier in Iraq I was, I now know, abetting your idiocy and your crimes. The Iraq War is the largest strategic blunder in U.S. history. It obliterated the balance of power in the Middle East. It installed a corrupt and brutal pro-Iranian government in Baghdad, one cemented in power through the use of torture, death squads and terror. And it has left Iran as the dominant force in the region. On every level—moral, strategic, military and economic—Iraq was a failure. 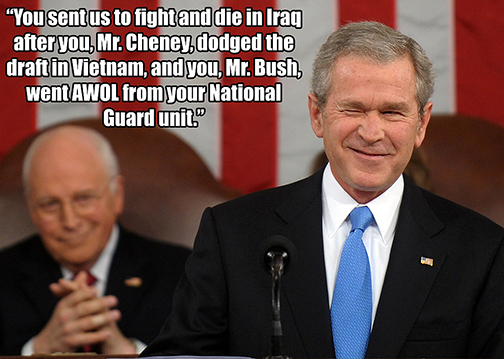 And it was you, Mr. Bush and Mr. Cheney, who started this war. It is you who should pay the consequences. I would not be writing this letter if I had been wounded fighting in Afghanistan against those forces that carried out the attacks of 9/11. Had I been wounded there I would still be miserable because of my physical deterioration and imminent death, but I would at least have the comfort of knowing that my injuries were a consequence of my own decision to defend the country I love. I would not have to lie in my bed, my body filled with painkillers, my life ebbing away, and deal with the fact that hundreds of thousands of human beings, including children, including myself, were sacrificed by you for little more than the greed of oil companies, for your alliance with the oil sheiks in Saudi Arabia, and your insane visions of empire. I have, like many other disabled veterans, suffered from the inadequate and often inept care provided by the Veterans Administration. I have, like many other disabled veterans, come to realize that our mental and physical wounds are of no interest to you, perhaps of no interest to any politician. We were used. We were betrayed. And we have been abandoned. 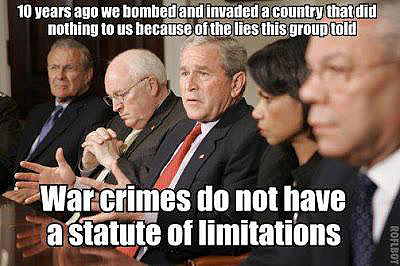 You, Mr. Bush, make much pretense of being a Christian. But isn’t lying a sin? Isn’t murder a sin? Aren’t theft and selfish ambition sins? I am not a Christian. But I believe in the Christian ideal. I believe that what you do to the least of your brothers you finally do to yourself, to your own soul. My day of reckoning is upon me. Yours will come. I hope you will be put on trial. But mostly I hope, for your sakes, that you find the moral courage to face what you have done to me and to many, many others who deserved to live. I hope that before your time on earth ends, as mine is now ending, you will find the strength of character to stand before the American public and the world, and in particular the Iraqi people, and beg for forgiveness.